- Fabric scraps - I chose satin and organza because I regularly raid the Joann's remnants bins to make dress up clothes and I always have a selection at home. First trace the outline of the ornaments on tissue paper - Not only is it faster to trace on tissue paper than on fabric but for lightweight fabrics it helps prevent puckering/bunching while machine stitching. 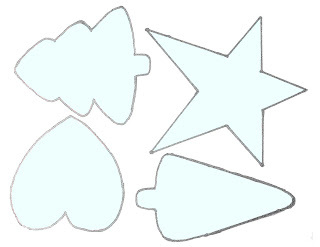 Cutout the shapes and place on your fabric - Leave a 1/4 inch sewing allowance when positioning the shapes. The fabrics should be placed right side together. Cut a piece of golden string or ribbon about 5" long and tie the ends as shown below. The knot will prevent the string from getting pulled out from the seam. Pin the string in position, making sure you are between the "outside" layers if you are using more than 2 layers and that the knot will be inside once the stitching is done. Stitch the outline with your sewing machine, leaving a small opening (3/4 inch) preferably on a straight segment. Carefully clip excess fabric in the "peaks" and make a notch in each "groove" to avoid bulk/puckering once you turn the items right side out. There is a great tutorial here. Those are so pretty and shimmering. Thanks for linking :).